Gooree’s has two main Cellar Doors. One is set at the entrance of the property on the Castlereagh Hwy and caters for visitors 7 days a week open Mon-Fri 10am-5pm & Saturday and Sunday 11am-4pm). 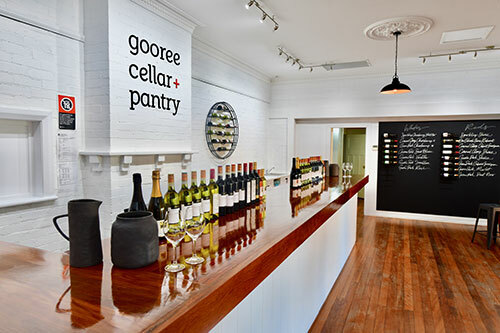 Our other Cellar Door + Pantry is located in the middle of town at 48 Market Street and conveniently located just a short stroll from the centre of Mudgee. In addition to our array of wines on offer, visitors can also purchase produce and condiments sourced purely from local operators. Seasons & crop permitting, lucky guests may find complimentary home-grown produce from our vegie garden at the entry to the cellar door. An on-site picnic area and undercover courtyard add to the flexibility of our Cellar Door to cater for larger groups and/or families.